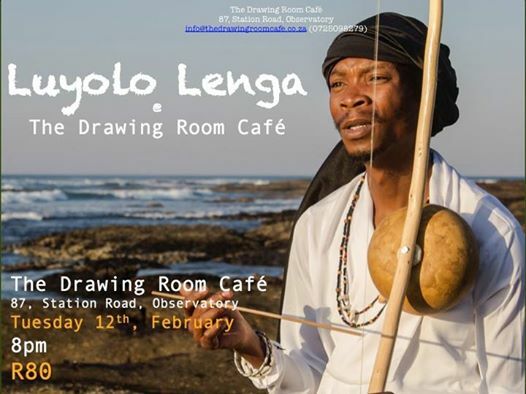 Luyolo Lenga is a composer, author and arranger of a fusion styles of music that pays homage to the isiXhosa language, accessing ancestral sounds from ancient stringed and percussion instruments, utilising classical techniques and shifts back and forth through time gathering elements of jazz and a range of contemporary styles. The primary overlay is the use of a variety of ancient bows, uhadi, umrhubhe, umakhwenyane, ikatara, all hand crafted and mastered by Luyolo. Once the percussive and ancestral stringed instruments have laid the foundation, the voice is free to explore the range, solo, in harmony, always in isiXhosa. Western instruments (such as guitar and brass) that have a history of being incorporated into traditional Southern African music melt easily into the mix. Even with these apparently opposed and diverse elements Luyolo’s music never sounds forced or contrived; it adheres to the natural flow of the musicians’ inspiration. Join us as we share in Luyolo's offering.